Abstract. Bulk-carbonate carbon isotope ratios are a widely applied proxy for investigating the ancient biogeochemical carbon cycle. Temporal carbon isotope trends serve as a prime stratigraphic tool, with the inherent assumption that bulk micritic carbonate rock is a faithful geochemical recorder of the isotopic composition of seawater dissolved inorganic carbon. However, bulk-carbonate rock is also prone to incorporate diagenetic signals. The aim of the present study is to disentangle primary trends from diagenetic signals in carbon isotope records which traverse the Permian–Triassic boundary in the marine carbonate-bearing sequences of Iran and South China. By pooling newly produced and published carbon isotope data, we confirm that a global first-order trend towards depleted values exists. However, a large amount of scatter is superimposed on this geochemical record. In addition, we observe a temporal trend in the amplitude of this residual δ13C variability, which is reproducible for the two studied regions. We suggest that (sub-)sea-floor microbial communities and their control on calcite nucleation and ambient porewater dissolved inorganic carbon δ13C pose a viable mechanism to induce bulk-rock δ13C variability. 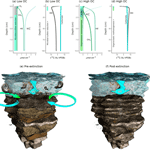 Numerical model calculations highlight that early diagenetic carbonate rock stabilization and linked carbon isotope alteration can be controlled by organic matter supply and subsequent microbial remineralization. 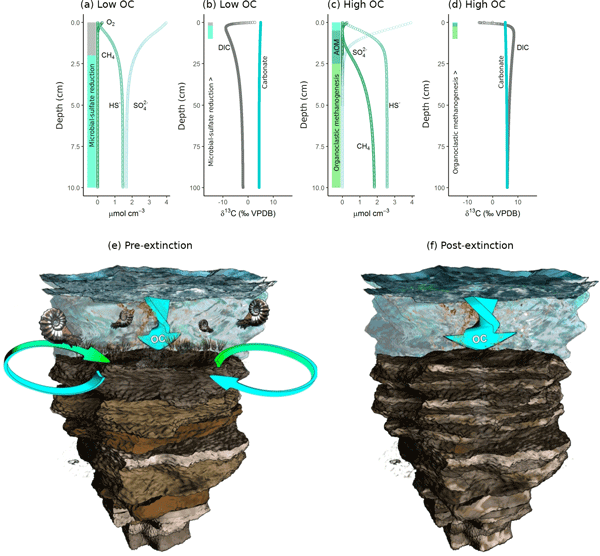 A major biotic decline among Late Permian bottom-dwelling organisms facilitated a spatial increase in heterogeneous organic carbon accumulation. Combined with low marine sulfate, this resulted in varying degrees of carbon isotope overprinting. A simulated time series suggests that a 50% increase in the spatial scatter of organic carbon relative to the average, in addition to an imposed increase in the likelihood of sampling cements formed by microbial calcite nucleation to 1 out of 10 samples, is sufficient to induce the observed signal of carbon isotope variability. These findings put constraints on the application of Permian–Triassic carbon isotope chemostratigraphy based on whole-rock samples, which appears less refined than classical biozonation dating schemes. On the other hand, this signal of increased carbon isotope variability concurrent with the largest mass extinction of the Phanerozoic may provide information about local carbon cycling mediated by spatially heterogeneous (sub-)sea-floor microbial communities under suppressed bioturbation. How to cite: Schobben, M., van de Velde, S., Gliwa, J., Leda, L., Korn, D., Struck, U., Ullmann, C. V., Hairapetian, V., Ghaderi, A., Korte, C., Newton, R. J., Poulton, S. W., and Wignall, P. B.: Latest Permian carbonate carbon isotope variability traces heterogeneous organic carbon accumulation and authigenic carbonate formation, Clim. Past, 13, 1635-1659, https://doi.org/10.5194/cp-13-1635-2017, 2017. Stratigraphic trends in the carbon isotope composition of calcium carbonate rock can be used as a stratigraphic tool. An important assumption when using these isotope chemical records is that they record a globally universal signal of marine water chemistry. We show that carbon isotope scatter on a confined centimetre stratigraphic scale appears to represent a signal of microbial activity. However, long-term carbon isotope trends are still compatible with a primary isotope imprint.